As it has been said, one of the main problems for power quality are voltage dips. Due to high renewable penetration level in transmission system, Transmission System Operators (TSO) demand to this sort of energy source support voltage under voltage sags. This obligation has provoked a huge investment in devices to support wind systems during voltage dips. Fig. 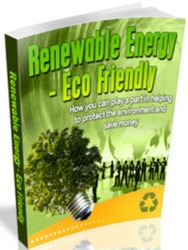 2 shows the three main technologies in the wind turbine industry. Their behaviour is different in continuous operation and during voltage dips. Fig. 2a shows the fixed-speed wind turbine with asynchronous squirrel cage induction generator (SCIG) directly connected to the grid via transformer. Fig. 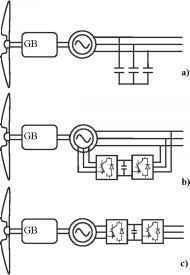 2b represents the limited variable speed wind turbine with a wound rotor induction generator and partial scale frequency converter on the rotor circuit known as doubly fed induction generator (DFIG). Fig. 2c shows the full variable speed wind turbine, with the generator connected to the grid through a full-scale frequency converter. Fig. 2. 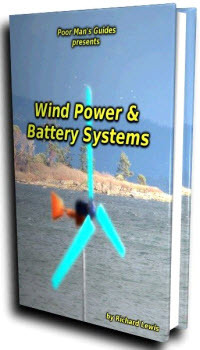 Wind turbine technologies. DFIG stator is connected directly to the network but its rotor is connected to the network by means of a power converter which performs the active and reactive power control. A voltage dip will cause large currents in the rotor of the DFIG to which the power electronic converter is connected, and a high rotor voltage will be needed to control the rotor current. When this required voltage exceeds the maximum voltage of the converter, it is not possible any longer to control the current desired (Morren, de Haan, 2007). This implies that large current can flow, which can destroy the converter. In order to avoid breakdown of the converter switches, new DFIG wind turbines are provided with a system called crowbar connected to the rotor circuit. When the rotor currents become too high, the converter is disconnected and the high currents do not flow through the converter but rather into the crowbar resistances. The generator then operates as an induction machine with a high rotor resistance. When the dip lasts longer than a few hundreds of milliseconds (Tmax_crcmihar), the wind turbine can even support the grid during the dip (Morren, de Haan, 2007; López et al, 2009). The full converted wind turbine is connected to the network through a converter; and therefore the converter controls the wind turbine during de dip in order to fulfill the Grid Code Requirements. SCIG are used as fixed speed wind generator due to its superior characteristics such as brushless and rugged construction, low cost, maintenance free, and operational simplicity. However it requires large reactive power to recover the airgap flux when a short circuit occurs in the power system, unless otherwise the induction generator becomes unstable due to the large difference between electromagnetic and mechanical torques, and then it requires to be disconnected from the power system (Muyeen et al, 2009; Muyeen & Takahashi, 2010). Next section describes different solutions to support the transient behaviour of SCIG and old DFIG wind turbines that do not fulfill fault ride through requirements.